Can it support solar panels or wind turbines on site? assuming it could support solar or wind what exactly would it power? Goodle map show some sort of civilization to the south. Might as well locate it there and not have to traverse the perimeter of the atol. On the google map, it looks like there is still a crater (or another crater) about 30 ft deep and the same diameter of the dome, right next to the dome, in the water about 100 ft to the NE (just left of the frame of the above photo). Were there two craters? Or did they put the radioactive fill on land nearby because it was easier? Interesting. Just reading about Sacramento's decomm nuclear plant Rancho Seco. View http://www.satellite-sightseer.com/id/6040/United_States/California/Sacramento/Rancho_Seco_Nuclear_Power_Plant. According to this website, there were several tests conducted around the Enewetak Atoll. The one referred to in the label -- the Cactus test -- was conducted at least 3 feet above the ground surface of Runit Island. Other bombs were detonated in the lagoon, such as in the Umbrella test (150 feet below the surface) and the Yellowwood test (on a barge). 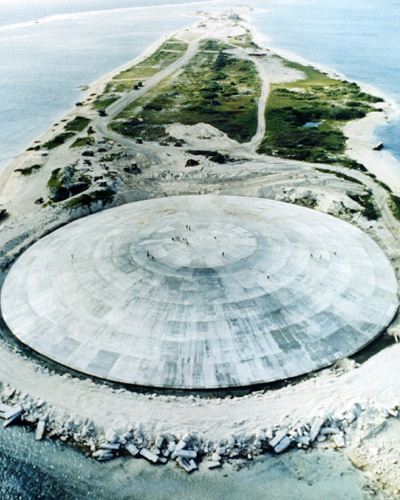 To clarify things a bit, we also read that "in 1979-1980 [the crater from the Cactus test] was used as a burial pit to inter 110,000 cubic yards of radioactive soil scraped from the various contaminated Enewetak Atoll islands." And by the way, thanks, Anonymous (MARCH 9, 2009 3:13:00 AM CDT), for the Google Maps link! And to thomaspa & Georgia for the images! Are those people walking on the surface? looking it up on google earth, have you noticed the strange tree formations on the islands north of this one? anybody knows what they are? At first I thought the trees were part of an afforestation project, but the gridded layout is more indicative of cultivation. But what is being farmed? Commercial lumber? Coconut products, including coconut oil, soaps, body oil and foodstuff? One wonders if residual radiation is now at such a low level that applying body oil on the skin, for instance, is safe enough. With a bit of googling I found this article by AFP about using coconut oil to generate electricity in remote Pacific islands. One processing plant experimenting with turning coconut oil into a diesel fuel substitute is located in the capital of the Marshall Islands, the island group to which Runit Island, part of Enewetak Atoll, belongs. we have been orgying all on your Fisk Maps at Flicker, and hung one onto today's New Orleans Ladder, with links and all'dat. You are Herolero! We also hung you on our list of Stitch'hikas. I first ran across one here: http://www.blueshighway.org/ which ironically is where I grew up. Please come check us out, and if you want hook us up wit'yo thang too. Please fang back through the archives. Help us get ready for flood/hurricane season. Have a good time! I really really really like your blog. Some might mistake that for a mothership UFO! It is extremly sad that the young people of the Marshall Islands - that live in Hawai`i are unaware of what the U.S. has did to their homeland. An anti-propaganda educational thang would be GREAT. Also, empowerment of their magnificent navigational skills & cultural identity which has been lost to the younger folks. The roots of their amazing lifestyle prior to the horrific nuclear bombing of their islands. SUPERFUND Sight should be cleaned up ~ That the people may return to live their lives prior to radioactive Hell. God Bless the Marshallese people & the clean up of their homelands ~ that their lives may return ~ Proud & whole ~ being able to live a subsistence life style without cancer induced by radioactive contamination! Look at the Hanford Site in the US...Another big mess the atom boys created! And of course Karabolka in Russia! The 'Crater' in the lagoon adjacent to the Runit Dome is from the 'Lacrosse' detonation (5th May 1956) of 40 Kilotons. Anybody has more informations or details about that? I was one of the militaary personnel that built the dome and moved the soil and debris from various islands on the atoll. The sad thing is the VA fails to reconize us as radiation exposed vets and will not compensate us for the cancers etc. we still suffer from. I too was one of the cleanup crew, I was there from Jan 79 thru Jan 80. there were numerous shots on or near Runit. Most of the plutonium came from the Quincey shot which went nonnuclear and spread plutonium, but the main problem came because they placed the Fig shot on top of the Quincey shot site which was a very low yield shot equil to about 40 tons of TNT. I did develop colon cancer and tried to get compensation, but the VA said I do not classify as a radiation exposed vet. I was a 1st Lieutenant stationed on Lojwa base camp who worked on Runit Island from late June 1979 to February 1980. I was there when the last piece was placed on the top of the dome by a cement truck aptly named Grandpappy. That was on the 6th of Sept of 1979. Morley Safer from 60 Minutes visited the dome when I was there. I helped seal up the command bunker (20 foot reinforced concrete walls) when we left Runit. Also remembering burning down the concrete bag warehouse. I have not experienced any issues myself.